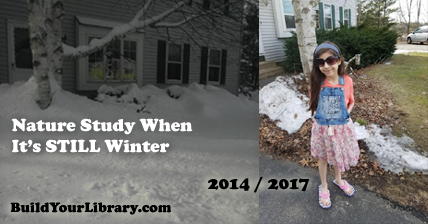 [Original: March 2014] It may be March, but in many states, it’s still very much winter. If you are anything like me, you are dreaming of the day when you can throw open your windows to let in a warm breeze and see green grass and budding flowers again. Alas, it will be at least another month or two of snow and ice in my neck of the woods. 1. Study the snow. This sounds pretty obvious, but snowflakes are amazing things. This is a great time to read Snowflake Bentley by Jacqueline Briggs Martin. When it’s snowing, you can take a piece of black construction paper and collect some snowflakes to study with a magnifying glass or handheld microscope. 2. Look for animal tracks in the snow and try to identify them. Even in the winter there are many animals out and about. We’ve seen deer tracks and there are always squirrels around. 3. Build a bird center in your yard near a window. Set up a bird feeder or two and attract as many birds as you can. On the days you just don’t want to deal with all the winter gear and cold weather, you can sit in the window keeping watch over all the feathered friends who stop by for a visit. Keep a bird guide (Peterson Field Guide to Birds of North America is a great one) and a notebook and pencil nearby to identify the birds you see. 4. Take a winter nature walk. What do you notice this time of year that you don’t at other times? Take some paper and crayons and do tree rubbings. Can you identify the trees by their bark? Which trees are completely bare and which maintain their leaves all winter? Pay attention to the sounds – the world seems quieter in winter, but there are still distinct “winter sounds.” Focus your attention and see what you can hear. 5. Bring some green indoors. This is a great time to start planning your spring garden! Plant some seeds, or just purchase a houseplant for your child to care for. 6. Look at the night sky. Especially on a clear night, this time of year is great for stargazing. Read Find the Constellations by H.A. Rey and then see what constellations you can identify. Learn about the phases of the moon, meteor showers, and more. Try to get outdoors at least once a week and explore. (And let them burn some of that pent up energy!) If you live in a winter wonderland, what do you do for winter nature study? 7. Practice Nature Photography! Taking pictures is a great way to get children to be more observant of their surroundings. Give them a camera and direct them towards taking pictures of the early signs of spring. You’ll be surprised at what they come up with. 8. Study weather. Because this time of year can vary so much, it’s a great time to study the weather! Keep a weather journal for a few weeks and track the different types of weather you get at this time of year. How much does the temperature fluctuate? What kinds of clouds are in the sky and what do they mean? One of my favorite books for learning about the weather is Weather! by Rebecca Rupp, it’s full of great information and it also has plenty of easy to re-create experiments and activities to keep your little meteorologist busy. So, do you even have any snow in an area that is supposed to? Please feel free to share your ideas in the comments!